I've had my Away Carry-On 'smart' luggage for over TWO years now. I've traveled with it extensively, carrying it to over 30 countries and countless airports. Curious to see how it fared? Read my review for all of the details. The battery pack is no longer in my bag (it was taken out when I had to check my bag going to home from Japan - with a connecting flight through China). I have noticed an increase in questions at boarding gates whenever I use the bag. They ask me if the battery pack is inside my bag and some even check to see. The new versions of Away Luggage now come with an easily removable battery. You can find out more here. I have now had this luggage for a full year. I still love it and stand by my initial review. The only place I have had trouble with the bag is going through China. I carried it on a flight to Japan that connected through Beijing. When I went through security on the way there I was pulled aside and they had to take the battery out with a power drill. It wasn't a huge issue, around 10 minutes extra going through security but do be aware. Also, please note you CANNOT check this bag if you are going through China. They will hold the bag and take the battery out. You may be wondering why a crazy budget seeker like me is recommending a luggage that is over $225. The first added benefit that I absolutely love is their new compression system. It makes this a no-brainer for people who want to avoid checking luggage and the fees that come with it. (aka saving money when you travel) In the video below you can see the compression system in action and be amazed at how much I packed in this tiny suitcase. So it fits a lot of stuff - a lot of carry-ons do that. But if you see in the video (click the damn video!) their compression system really does make a difference when it comes to pushing all your clothes together and down so you can use the other side for toiletries/shoes/makeup and other stuff. I have noticed an increase in questions at boarding gates whenever I use the bag. They ask me if the battery pack is inside my bag and some even check to see that it has been removed. 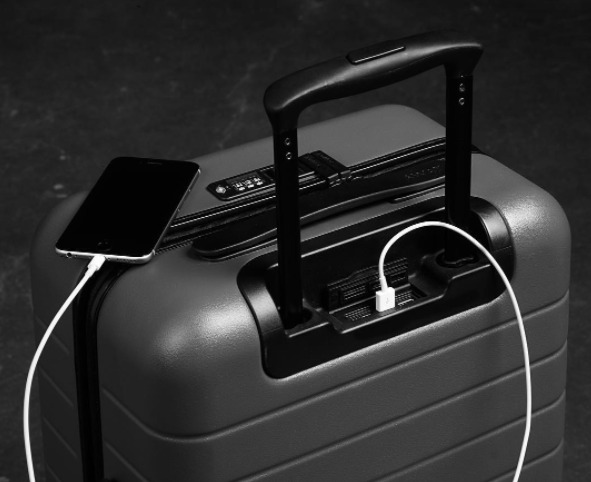 The new versions of Away Luggage now come with an easily removable battery. You can find out more here. Another great little-added benefit is the laundry bag that comes in the small pouch built into the side of the bag. I love being able to stuff clothes in there when they get gross. Not having to worry about stealing a bag from the hotel or letting my sweaty clothes infect my clean clothes. Plus, since the laundry bag is waterproof, you can use it to hold your belongings if you are going anywhere you are worried about sand and/or water. The carry on measurements are perfect for not only American based flights but also the budget carriers in Europe and Asia. This is a huge plus because there are certain airlines that love to tack on extra fees for your carry on being a half inch too big (cough****RyanAir) and that just won't happen with this piece of luggage. The hard shell on the luggage has so far held up quite well. But, I do suggest getting it in a darker color if you want to hide scratch marks. So after a lot of details about the bag, I will leave you with this: Yes, I am a budget traveler, and I will try to save money in every way possible, BUT if you are a constant traveler and are looking for a bag that will help you deal with the stress of the airport then just get it. It's an invaluable asset when it comes to packing a ton of stuff and charging on the go. Plus at a $225 it is an excellent price point for 'smart' luggage.